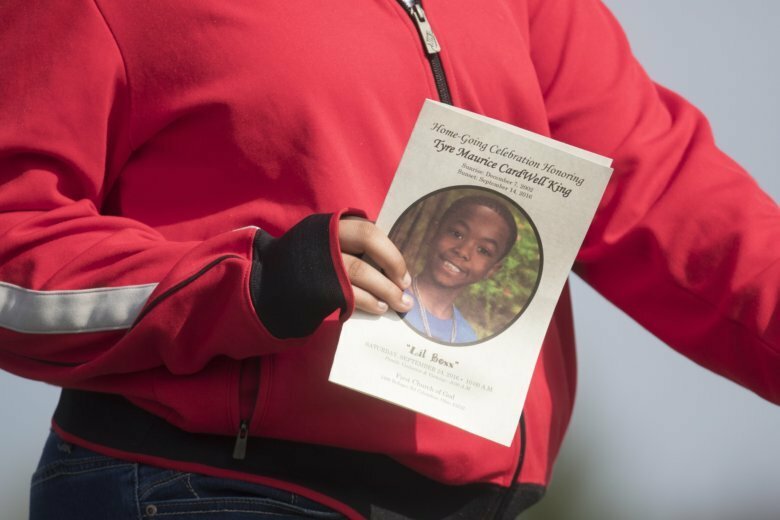 COLUMBUS, Ohio (AP) — Witnesses say that the white police officer who killed a black 13-year-old used a racial slur after firing and that a toy gun the eighth-grader had wasn’t visible when the confrontation occurred, according to a federal civil rights lawsuit filed Friday on the second anniversary of the shooting. The lawsuit filed by Tyre King’s grandmother challenges the police account, characterizing his death as the result of excessive force, racial discrimination and an alleged failure by the police department to properly investigate and discipline officers for racially motivated or unconstitutional behavior. Officer Bryan Mason, Police Chief Kim Jacobs and the city are named as defendants in the lawsuit, which seeks unspecified damages. By “tacitly authorizing” their behavior, “the policymakers and those responsible for hiring, training and supervision of police officers within the City of Columbus acted negligently, recklessly, intentionally, willfully, wantonly, knowingly and with deliberate indifference to the serious safety needs of the citizens of Columbus, including Tyre King,” the lawsuit said. A Columbus police spokeswoman said it would be improper to comment on the litigation. The head of the local police union didn’t immediately respond to a message seeking comment, but the group previously said Mason acted according to policy. Police have said Tyre was in a group of young men who robbed a man of $10 at gunpoint, and Mason was responding. Mason previously told investigators that Tyre tried to pull what appeared to be a real firearm from his waistband and said he fired at the teen when he saw a laser sight on the weapon and feared being shot. It turned out to be a BB gun that police later determined was inoperable. A grand jury voted not to indict the officer in the shooting, which prompted protests in Columbus and became part of national discussion about police killings of black males. Mason had been involved in three previous shootings and had been cleared of wrongdoing in each case, including another fatality. Records show Tyre was shot three times, including in the head and torso. An attorney for his family has argued the results indicate he was running away and wasn’t a threat when he was shot. A forensic pathologist who examined his body for his family reached the same conclusion. Mason has said that Tyre spun to his right after the first shot. Find Franko on Twitter at http://www.twitter.com/kantele10 .